And still the price cuts roll in as Bob Cury at RJC Yacht Sales sends news of a price reduction of $600,000 each on two of his centrally listed motor yachts, the 43.28m Relentless and 37.5m Caprice. Relentless is a tri-deck yacht built to ABS class by Trinity Yachts in 2001. MCA compliant, she features an elegant custom interior accommodating 10 guests in an on-deck master suite, three double staterooms and a twin cabin. Other features include a spacious saloon, formal dining room, skylounge and a large Jacuzzi on the flybridge. 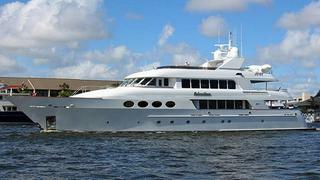 Twin 1800hp MTU engines give Relentless a range of 5,000 nautical miles at 10 knots and she's now asking $13.9 million. Caprice is an early Oceanco motor yacht built in 1994 to a design by the late Gerhard Gilgenast. ABS classed, her custom Donald Starkey interior sleeps eight guests in a four stateroom layout: a master suite and three twin staterooms. Caprice is powered by twin 1350hp Deutz engines giving her a range of 2,500 nautical miles at 15 knots and she's now down to $3.9 million.